If films like this are your sort of thing, it will make a great addition to your collection. 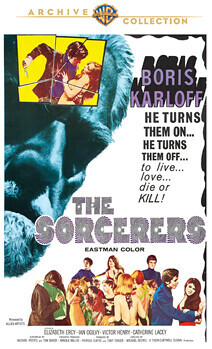 Despite what the title may suggest, The Sorcerers does not feature Boris Karloff as a magician, warlock, mage or other such magical being. In fact, there isn’t really any magic at all, unless you count the magic of science and psychedelic swingin’ London of the 1960’s. But oh, what a magical time it was when an aged hypnotist, long since disgraced and discredited by his peers, finally sees his life’s work come to fruition in the form of a machine that can control the minds of others. After finding a suitable test subject, Dr. Monserret (Karloff) hopes to use his marvelous machine to the benefit of humankind, but it turns out to… well, come on now. This is Boris Karloff movie - you didn’t really expect things to turn out well, did you? I don’t think the man made a lot of movies where everyone wound up with a plate full of rainbows and lollipops at the end. What impressed me about The Sorcerers was the subtle manner in which it approached its rather outlandish plot. It would’ve been easy to cast Karloff in the role of a crazed lunatic or mad scientist, but instead he brings Dr. Monserret to life as a quiet man with tired eloquence. There’s no grand schemes, no world conquering or wild visions of revenge; just a man trying to perfect a machine and restore honor to his tarnished image. Similarly, Catherine Lacey performs admirably as Monserret’s wife, equally worn and weary by the hardships of her long life. But unlike Karloff, she undergoes a transformation, drunk on power and mad with the idea of living the life she was denied. The Sorcerers isn’t a creature feature and the horror doesn’t come from a man in a cheap monster suit; the real danger in this film is the very real idea that a person kept down for too long has the potential to go insane when given a taste of the power they have long been denied. I should give mention to Ian Ogilvy’s performance as well. He’s perfectly cast as a bored London teenager on the hunt for a new and exciting experience who gets more than he bargained for. But potential viewers should be prepared: this movie is from 1967, so the performances and pacing of the film are pretty different than what modern viewers are accustomed to. Of course, if you’re seeking out old Boris Karloff movies through Warner Archives’ video-on-demand service, chances are you’re pretty accustomed to the old timey awesomeness of these kinds of flicks. The movie itself is decidedly old-school. It’s very slow and very deliberate and while it’s anything but exciting, I never found it boring in the least. This is due not only to the fine performances, but to the odd and interesting camera work on display. The film is far more stylish than one might expect from a director with only three films to his credit, but I suppose it should come as no surprise that director Michael Reeves went on to direct Witchfinder General, regarded by many as one of the finest horror films of all time. I haven’t yet seen Witchfinder General, but based on what I’ve seen in The Sorcerers, it’s definitely in my queue. Plus, there’s just a whole lot of sweet 1960s British style. Mini-skirts, go-go boots, and dudes with Beatle haircuts smoking grass in the middle of a club where some Gerry and the Pacemakers knock-off band is rockin’ out every weeknight. Who doesn’t love that sort of thing? The transfer isn’t bad, but it isn’t perfect either; there’s plenty of crackle, dirt, and the occasional stray hair floating across the screen at any given time. But honestly, that sort of ambiance adds to the overall experience, so it’s not anything I’d complain about. The Sorcerers probably isn’t for everyone. It is definitely of its era and it probably falls under the category of “if that’s your sort of thing”. But if films like this are your sort of thing, The Sorcerers will make a great addition to your collection and the perfect film to watch during this holiday season.